Newly listed on eBay I have several items for both auction sites, Federico-Fantasy-Art and Poodelicious-Artwork-by-Federico. 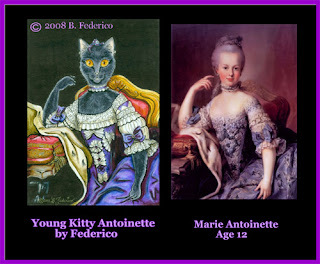 Here they are, an original pen & ink Black Cat Parody Painting of Marie Antoinette and an original architectural painting of a historical house in San Diego that I painted back in 1990. 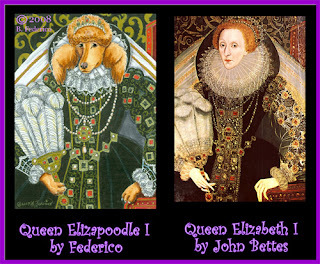 On the Poodelicous side, I've listed an original Poodle Parody Painting of Queen Elizabeth the First. Click on the pictures and they will take you directly to each auction. All your new pieces are lovely. The Marston house is GORGEOUS!! BEAUTIFUL BECKY! You & your art work! 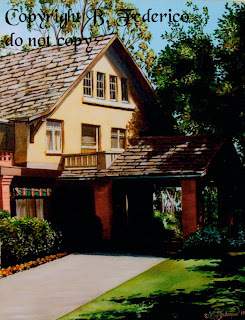 Your ORIGINAL Historical MARSTON HOUSE Oil Painting looks so good, it's almost like a photo image. But better because it's an original Federico GORGEOUS oil painting. What was that famous haunted house you painted? Oh that was absolutely beautiful too. Of course all your parodies can't be duplicated. You're the female LOUIS WAIN!!! Once again Becky, you have out done yourself. Thank you, Chris! I love old houses; wish we'd live in one! Why, thank you, Lady Lyndy! So sweet of you to say so! Tho I'm not sure if I'm the female version of Louis Wain....but thanks for the compliment! I think some of Louis Wain's paintings as he progressed into schizophrenia were pure genius. That's what he saw in his inner eye, so that's what he painted.